Heh, true. Thing is, they don't consider those things you listed as bad to begin with. They don't see those as atrocities in the first place. If anything, they see them as how Obama is 'soft'. Drone strikes on terrorists in Yemen? Whatever! We should have half the U.S. Navy in the Black Sea by now! Armchair generals always fight the last war crime. You need to write a book, HP. Something Hunter Thompsonish, a scathing indictment of the state of modern US society. Maybe I should! As of earlier this year, I'm unlikely to be thrown into a for-profit detention facility in the desert for doing so. I bet the pink underwear would be flattering, though. "We can't stop here, this is Obama country." I'm still trying to see how this justifies multiple special investigations over the last few years. It's a big deal because the President lied about selling missiles to Iran after they blew up 241 U.S. Marines and bombed the U.S. Embassy, killing 63, libby libs! G. Gordon Libby. Okay, maybe we crowdsource the book. I imagine this as Hunter S, meets Keller. Boehner tweeted this yesterday. 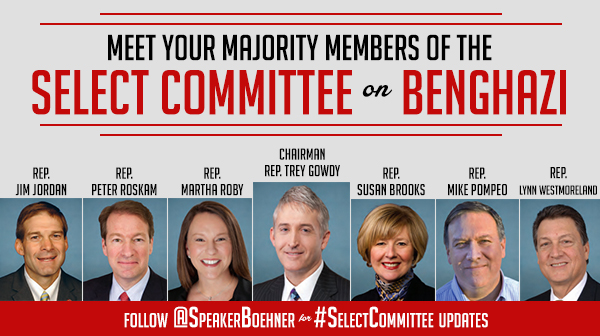 I wonder when we'll get to hear the committee's theme song. Looks like a good representation of the GOP. 100% white, 70% male. Edit: Theme song is "Don't Stop Believin". At what point does the GOP just stop, turn to the camera, and reveal that for the last 30 years they've been an elaborate, farcical prank orchestrated by none other than Andy Kaufman. I love this. A lot. I enjoy anything that lets me corner people with their own cognitive dissonance and then see how they backflip out of it. The main issue I keep hearing from sources like NPR is whether or not the Democrats will participate. Do they abstain because they're worried their participation will make the investigation look legitimate or do participate so that they can interview the witnesses and serve as a counter balance to what they feel the Republicans are really aiming for. Honestly, I don't see how they can NOT participate. Like it or not, the Republicans are the majority, they've formed this commission, and you need everyone to be a part of it. If you feel it's wrong then express that at every chance but to simply sit out? I get the logic but I feel like it would make things even more partisan than they already are. The next time Democrats have control of the house you'd have Republicans sitting every commission and committee out saying they were all farces and then campaign on the Democrats silencing all disent in the house. We'd just be going from one extreme of Congress to the other while one team sat out until the next elections. I'm really not liking that trend already. Lately the democrats' big wins have been *not* playing ball when invited to by the GOP. They basically won the government shut down, obamacare is well on its way being a footnoted reality like johnsoncare is, and literally no one who is on the fence vote wise cares about Benghazi. They'll do better, from my flawed perspective, just handing the GOP rope with which to hang themselves instead of playing tug of war. Bars may jail your body, but ideas can imprison your mind. Almost all of the Republican talking points on Bangazi have already been answered by *Republican-led* investigations. But the Democrats damaged themselves by not producing all the relevant emails when subpoenaed, and that *is* a valid complaint even when the new one adds no content. They need to participate to avoid looking like they are hiding something. And the best outcome is that they can raise awareness of what actually happened and didn't happen. Vox had an interesting article about how the conservative Benghazi conspiracy believers might not actually be crazy crackpots, but are instead responding rationally and predictably: they are looking for information to explain something that happened that fits what they already believe about the world and is confirmed by people they trust. Let's take a look back at the origins of the Benghazi controversy. After the actual attack on September 11th, 2012, Benghazi immediately became the top issue in both the right-wing press and, really, the whole American mediasphere. To conservatives, it was more than just a national tragedy. It was confirmation of their belief Obama wasn't up to the task of confronting anti-American extremists, beginning an availability cascade. Then the Obama administration's initial story on Benghazi fell apart. The attack was a targeted strike on a US facility, not a spontaneous reaction to an anti-Islam film. Conservative journalists and policymakers, already primed not to trust Obama, became convinced that there was a scandal. The Administration failed, then seemingly lied about their failure. They had to be hiding something! Among conservatives, this argument hit dead center. They already believe Obama is a feckless, incompetent liar. They think he plays fast and loose with American national security, and the credulous mainstream media is in the tank for him. The details of the Benghazi incident fit so perfectly into this already-extant perception of the President that Benghazi — more than the IRS, Solyndra, or any other purported Obama scandal — became the evidence du jour of Obama's failings among conservative voters, politicians, journalists, and think tankers. As the belief spread, an availability cascade became both informational and reputational. Conservatives inferred from each other that there was something real here (the informational component), and believing in an administration failure on Benghazi became part of being a conservative in good standing (the reputational component). So Benghazi became a classic Sunstein-Vermeule conspiracy theory. Conservatives became convinced the administration was covering up the truth about Benghazi and anyone who argued otherwise began to look like part of the conspiracy, or at least an unwitting dupe. A wealth of psychological research on group polarization shows that, when a group of likeminded people discuss an issue together, everyone's mind tends to shift towards the dominant view of that issue in the group. The more conservative legislators and media figures dug in on Benghazi, the more all conservatives were likely to believe in some kind of administration malfeasance. Or, you know, Benghazi is a transparent political move by Republicans to win the midterm and tarnish a possible 2016 Democratic presidential candidate. Which, I'm now just realizing, could just be me trying to explain something that happening that fits what I already believe about the world and is confirmed by people I trust. It was confirmation of their belief Obama wasn't up to the task of confronting anti-American extremists, beginning an availability cascade. If we just made embassies a branch of the military they'd have all the funding they needed. While completely ignoring budgetary cuts that resulted in reduced security in the first place. I love the people who love to talk about how while Bush had significantly more embassy attacks during his presidency, no one died. Not true. Not even true if you hew to the limited "embassy attacks", for which consulates don't count. January 22, 2002 - Militant group attacks US consulate in Kolkata, India, killing 5 policemen. June 14, 2002 - Car bombing outside US consulate in Karachi, Pakistan kills 12 and injures over 50, including 3 Americans and 5 local employees of the State Department. October 12, 2002 - Bali bombings kill seven Americans among 202 dead at a bar and nightclub. A bomb exploded at the American consulate at the same time. Feb 28, 2003 - Two policemen guarding the American consulate in Karachi, Pakistan killed in a motorcycle attack on their post. May 12, 2003 - 36 people including 9 Americans killed, and 160 wounded, in attack on a State Department housing compound in Saudi Arabia. (Yes - 13 Americans killed in a State Department controlled compound in an Arab country, and neither the Dems nor the Republicans went crazy with investigations and accusations...). July 30, 2004 - Two Uzbek guards killed at the American embassy in Tashkent by a terrorist bomb. December 6, 2004 - American consulate compound in Jeddah, Saudi Arabia penetrated by gunman who take 18 hostages. In the takeover and the assault to follow, four guards and five Saudi staff are killed. March 2, 2006 - David Foy, a US Foreign Service Officer (ie, diplomat), was specifically targeted and killed during an attack on the US consulate in Karachi, Pakistan. Three others died in the attack two days before President Bush visited the country. September 12, 2006 - Four gunmen shouting Islamist slogans attack the US embassy in Damascus, Syria. They were repelled at a cost of 4 Syrian soldiers killed and 12 wounded while protecting the American diplomats. March 18, 2008 - Second mortar attack on US embassy building in Sana'a, Yemen kills 19 and injures 16. The first attack was mis-targeted and hit a girl's school next door. July 9, 2008 - Three Turkish guards at the US consulate in Istanbul, Turkey were killed by attackers who drove up and opened fire. September 17, 2008 - 16 people including two American newlyweds were killed in an attack on the US embassy in Sana'a Yemen. Note, no one dying is actually their perception, thus Bush = flawless victory and Obama has killed four. And also it only counts if Mericans die. It only counts if the President isn't a true Merican. and the 4400 Americans that died because of lies about yellow cake and aluminum tubes don't count either. Right. Hillary had not yet spread her vulture's wings of "protection" over them, after all. Legitimate mistakes are one thing, but Clintonism is something the Republican National Politburo, in it's role as the executor's of the will of the American Narodna, must ruthlessly crush wherever it is found. I'm surprised that with such an apparently divisive issue, we haven't had anyone post here in support of the investigation. Did we echo chamber all the conservatives away? It was your endless snark. I'd imagine most of our more conservative members have either A. Been scared away by OG or B. Realize that this is stupid and keep hoping the House Republicans will move on to something more substantial.